This is the Carzone.ie used guide to the Skoda Kodiaq. The Kodiaq is the first in a wave of SUVs and crossovers from Czech company Skoda, designed to fill in the gaps in the brand’s showroom range when it comes to high-riding vehicles. 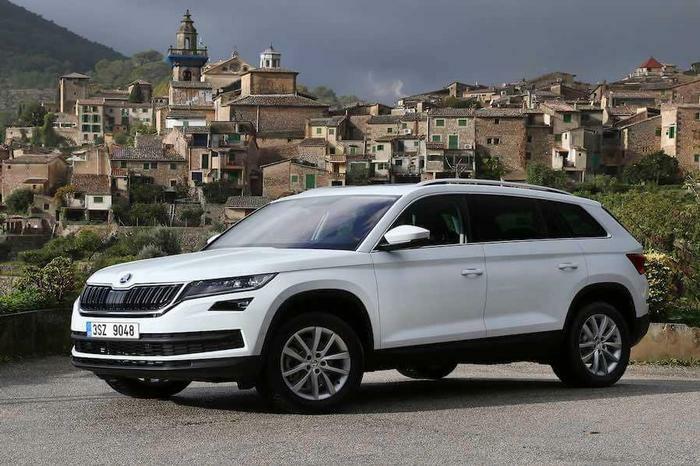 The Kodiaq is the biggest of the Skoda SUVs, sitting above the mid-sized Karoq and a third, even smaller crossover that’s yet to be confirmed, and – like so much of the Volkswagen Group products these days – it uses the MQB chassis to excellent effect. There’s a choice of five or seven seats on board, and the Kodiaq competes in the sub-premium large SUV sector. Skoda Ireland offers the Kodiaq with three engines, two gearboxes, two forms of drive and the choice of either five- or seven-seat configurations, spread across five trim levels – meaning there should be a Kodiaq for everybody. Basic specifications run Active, Ambition and then Style, with all versions getting at least LED rear lights, 17-inch alloys, some leather trimmings inside and a smartphone interface, but from Ambition upwards, the equipment count becomes far more generous and luxurious. Scout and Sportline are almost two trims apart, the former adding outside body protection and interior trimmings to focus on the off-roading capabilities of the Kodiaq, the latter wearing black detailing and sitting on sporty 19-inch alloys. The 1.4 TSI petrol engine with 150hp is available from Active entry point and comes with a six-speed manual as standard, or a six-speed DSG auto as an option. From Ambition upwards, the 2.0 TDI – offered with either 150- or 180hp – joins the line-up. It can be teamed to a seven-speed DSG auto and front-wheel drive as a 150hp unit, but if you opt for four-wheel drive then a six-speed manual (as well as the DSG) is also available. The 190hp variant is only available in 4x4 specification and with a DSG gearbox. All Scout models, by the way, are four-wheel drive as standard, including the 150hp TSI (where it is teamed solely to the six-speed DSG). Unless you’re planning to go off-road in your Kodiaq regularly, the four-wheel-drive models are not strictly necessary, which kind of rules the Scout out as our favourite. We’d advocate the 150hp TDI unit with front-wheel drive (bringing with it the DSG as standard), seven seats and in Style specification. That way, you get one of the best, most affordable seven-seat SUVs you can buy. The Skoda Kodiaq was a long time coming, but now it’s here, the Czech marque becomes one of the strongest manufacturers in terms of its product offering. The practical, likeable and elegant Kodiaq is a very capable all-rounder and it would suit family life as well as it would suit the lifestyle, outdoorsy types. The Kodiaq is at its absolute best in front-wheel-drive diesel format, with the full complement of seats onboard – whereupon you will find it very hard to find a better seven-seat SUV at anything like a comparable price.